Victor was a highly rated, twice capped, Argentine striker from San Lorenzo De Almagro. Although a regular in the United line up in his first sdeason, he failed to reach his expected potential and played mainly in the reserves in his second season. 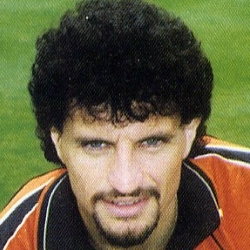 He left Tannadice in February 1993 to join Mitsubishi in Japan for a reported £175,000. Victor was born on this date in Rio Tercero, Argentina. Naturally, the main interest centred round the first appearance of Argentinian striker Victor Ferreyra. His introduction to Scottish Football was typical. In the first minute he controlled the ball on his chest, only to be immediately bundled off the ball by a defender. However, it was Duncan Ferguson who was held down by Chris McCart to earn us the first of two penalties during the match. Duncan took the kick himself, but unfortunately screwed his shot well wide of the post. United fans first sight of Victor Ferreyra in real action saw the Argentinian speed past Philliben only to be brought down by Billy Thomson who protested his innocence too strongly to the referee and was booked. This time skipper Maurice Malpas made no mistake from the spot to score his first goal of the season. 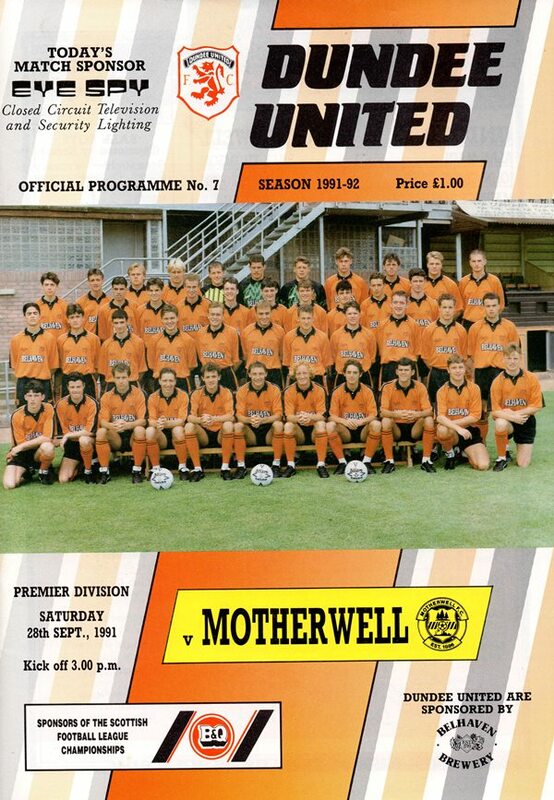 Motherwell, however, hit us on the break in the 32nd minute when Dolan's through ball split the defence and Ian Angus ran on to shoot low past Alan Main. Their equality was short-lived, however, because we went back into the lead in the 39th minute. John Clark's free-kick was controlled by Ferreyra but he was tackled and the ball broke to Gary Bollan who immediately fired the ball past Billy Thomson for his first goal for the club. Our 4-0 win at Brockville was not only our biggest win of this season, but the first time we have won a Premier Division encounter by four goals since we defeated Hamilton Accies 5-0 at Douglas Park in January 1989. Obviously, it is also our best return from an away fixture since then and, indeed, is our first success on opponent's territory since a l-0 victory at Love Street last March. Falkirk had four ex-United men in their line-up and as early as the eighth minute one of them Alex Taylor, was yellow-carded for a deliberate body-check on Victor Ferreyra. 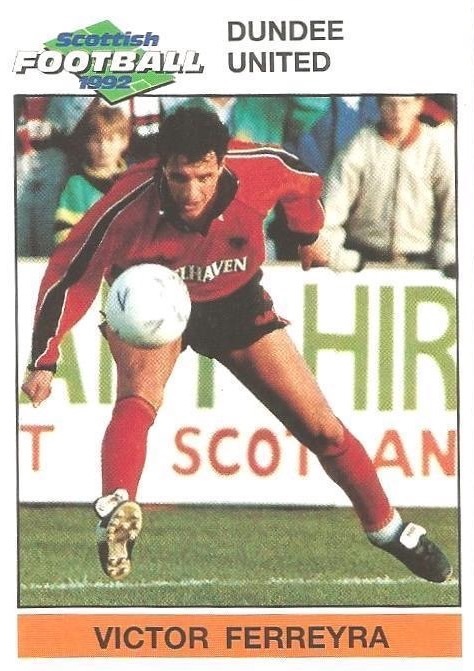 The opening goal came after 14 minutes when Dave Bowman's persistancy carried him past two Falkirk defenders on the right before sending over an inch perfect cross for Duncan Ferguson to head home his fifth goal of the season at the near post. Former United players in the home ranks continued to figure prominently. First Alex Taylor was injured in a clash with Dave Bowman and had to hobble off with a hip injury shortly afterwards. Then Guido Van De Kamp slipped as he came out for a Neil Duffy cross and Eddie May was literally on hand to palm the ball over the line, though it appeared he could just have easily headed the ball home! The "goal" was instantly chalked off by the referee. Before half-time Victor Ferreyra curled a free-kick past the defensive wall which Westwater only just managed to keep out. After Extra-time our cup record against Rangers is, to say the least, poor, but this was a very close contest and strangely there was little evidence of a titanic battle in prospect at the end of an opening 45 minutes that was by and large an insipid affair. True Ian Ferguson had hit the base of the post, but other than that the half had been devoid of incident. Having appeared to have turned the corner with the results against Celtic and Dundee, the lack of creativity in this meeting with Airdrie almost put us back to square one. Indeed, it was Airdrie who enjoyed the better of the early exchanges, but the game soon developed into a pattern of United possession,but little by way of chances being created. About the only exception to that was a John Clark 5 yarder, but Martin kept out his effort. Our cause wasn't helped when Billy McKinlay had to limp off injured. Early in the second period, John O'Neil did breach the Diamonds' defence, but after knocking the ball over Martin's head, his final shot went wide of the target.